PTFE (Polytetrafluoroethylene) is a semi-crystalline fluoropolymer that shows extraordinary thermal, chemical and mechanical which has lead to its use in a vast array of applications. (Polytetrafluoroethylene) is a semi-crystalline fluoropolymer that shows extraordinary thermal, chemical and mechanical which has lead to its use in a vast array of applications. To improve the mechanical properties, PTFE can be reinforced with additives such as glass fibre, carbon or bronze. 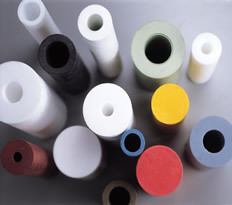 Macplas LTD is able to supply a range of PTFE solutions in sheet, rod, tube and film form.